Mercedes driver Lewis Hamilton claimed pole position for the Formula One Chinese Grand Prix after a cagey qualifying session on Saturday that set the stage for an intriguing start to Sunday's race. Hamilton's best time at the Shanghai International Circuit was 1 minute, 34.484 seconds, qualifying him a quarter of a second ahead of Lotus' Kimi Raikkonen. Ferrari's Fernando Alonso will start third. 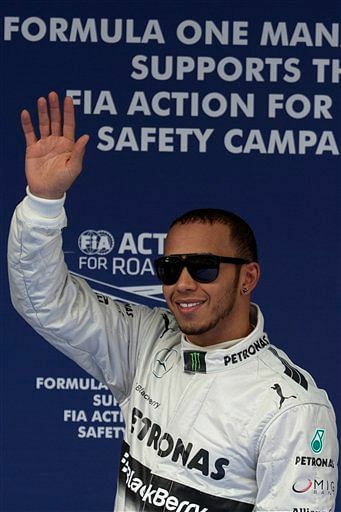 It was Hamilton's first pole with his new team after crossing over from McLaren in the off-season, and he felt it was a statement to those who said he should not have made the move. "It's an incredible feeling, so happy to have our first pole for some time," Hamilton said. "I'm just ecstatic really, the lap was great." "I can't answer (critics) with one result but bit by bit, as we progress and improve, they will have to stand corrected." "I am so grateful because it could have gone the other way. It was such a big choice for me and a big step for me but I made the right call." A cat-and-mouse qualifying session saw all runners restrict their time on the track to save sets of tires for the race, with all of the top 10 having only one flying lap in the final stage of qualifying. McLaren's Jenson Button and Red Bull's Sebastian Vettel both elected to do their flying lap on the harder of the two tire compounds, sacrificing grid position so they can have a longer stint at the beginning of the race. Button qualified eighth and Vettel ninth. Of the top three runners, Hamilton is likely going to have to pit first, as the Mercedes has quickly degraded the soft tire throughout the race weekend, and his times are likely to start dropping after as few as two or three laps. He was putting faith in his team in the decision to start on the softs and not follow the example of championship leader Vettel in choosing a lower grid spot but longer first stint on Sunday. "I have really good strategists and I just trust them and their decisions and stand by it," Hamilton said. "No matter what strategy you are on, everyone will struggle on the option tire whether it's high or low fuel." Red Bull's Mark Webber had a fuel pressure failure in the second sector of qualifying, coasting to a stop out on the circuit. He qualified 14th but was later relegated to back of the grid because the car did not have enough fuel in the tank to provide the requisite liter to race stewards. Mercedes driver Nico Rosberg, last year's winner, qualified in fourth, ahead of Ferrari's Felipe Massa and Lotus' Romain Grosjean. Daniel Ricciardo of Toro Rosso was surprisingly strong in qualifying seventh — one position off his career best — while Sauber's Nico Hulkenberg was tenth. Raikkonen came up just short of his first pole position in five years, set when he was with Ferrari. "Second is not too bad. It's the best I've achieved with the team. I would rather be in first place but we don't have the speed," Raikkonen said. The Finn won the season's opening grand prix in Australia by having one less pitstop than his rivals, and if he can nurse his tires well again on Sunday, he will be hard to beat. Raikkonen, however, was uncertain that could be achieved again. "It's a big question mark because we were pretty happy (Friday), but the car is not the same as then," Raikkonen said. "Hopefully it will turn out to be good tomorrow but it will be pretty close and whoever gets it exactly right will make a difference. Alonso edged Massa by about a tenth of a second to avoid being out-qualified by a teammate for a fifth straight time, which has never happened in his career. "The car has been competitive from Friday and this morning we made changes and the car responded well," Alonso said. "We have a good set up for the race, which is the most important thing. Tomorrow, if everything goes well, we should fight for the podium with both cars."